The sky above El Chorro was the colour of television tuned to a dead channel. Not like in an 80’s poltergeist fuzz kind of way, but more like when satellite TV came in and your channel turned that deep blue when you couldn’t afford HBO.. except brighter…with an explosion of sunshine…and epic majestic floating birds… and a fabled backdrop of limestone mountains. So really, the opposite of anything television.. Yeah, uhhhhhhh, I don’t know how to start blog posts?…..
My journey to El Chorro started with an open ended plea on Facebook “Going to Europe..anyone want to climb?” My only respondent was a friend I met in South Africa, Chris Helle. Chris and I met in Cape Town under similar circumstances. I was travelling solo and was looking for a climbing partner. Chris suggested we go to El Chorro, Spain. Never heard of it. It is a famous climbing destination, but I’m not that experienced.. I now know El Chorro quite well. I was up for anything and totally ecstatic to have a response and someone willing to go on adventure. That’s me on the left and Chris on the right. We just climbed a moderate Multi-Pitch called Valentines Day. My trip started where I live, in Toronto and then to London, where I was visiting family. El Chorro has a few accommodation options. I got off the train in El Chorro where a girl with a huge pack was waiting. She was obviously a climber. I asked her where she had stayed and she said “The Olive Branch” and suggested I check it out. I had planned on going there anyway, but with her reco and directions, I decided for sure. The Olive Branch. For me, I have learned to enjoy a shared bunkhouse or camping. Apart from the dollas saved, it really brings you together with fellow climbers, hikers and adventure type individuals. I admit, it can be a little uncomfy at first, but people are strange and I like that. The hope is, they become likably strange and I’m proud to report, that that is what usually happens. The bunkhouse I stayed in, which is also called “a refugio” a “bed and breakfast” (not really..) or “hostel”. It’s called “The Olive Branch”. It’s a small family run place on a beautiful, Spanish countryside property nestled in the mountains of EL Chorro. It’s almost exclusively climbers that stay here, but there were hikers and paragliders that I met. There was even a family of 4 that had left their jobs and school to do a year long trip around the world. Who needs work and schooling anyway?! When the owners of this place, Mel and her husband, found out I was Canadian, they told me they LOVE Canadians. Why?? Two special Canadian Climbers were the reason why The Olive Branch exists today… I’ll explain..
Mel was visiting her mother in El Chorro. She had a restaurant in town, but also this piece of property that she never used. Mel and her husband were travelling without direction and had recently uprooted from the UK to find a new place in life. They were camping on Mel’s mom’s property. Serendipitously, a Canadian couple came upon their campsite and asked if they could camp too. They had, with haste, left the Refugio down the road and had been sleeping in the forest and in caves…yes, caves. The Canadians were invited to stay and after a few days, had spread the word about the new accommodation. Mel describes things happening fast. “1 week we were homeless and had no idea what we were doing, the next week we had a brand new business, clients and a direction in life”. The Olive Branch is a pretty special place. I can say that the story of how it got started remains in its roots. For the people, by the people, kind of vibe. Most of the staff are climbers or travellers that dropped in, stayed and will eventually be on their way. Like a carousel of climbers, passing off information before they leave for the next group and so on. There’s even carousels of food, climbing gear, books, instruments and penned words that get passed onto the next. Cool. It costs between $10-$15/night depending on where you stay. Groceries can be bought in town or you can choose to eat at The Olive’s little restaurant kitchen. Cost – Olive Branch: $100 – I stayed for 7 nights. See more about the The Olive Branch on their site here. There is a lifetime of climbing here. Over 2000 routes and 50 crags and new developments every season. The crags in and around the Gorge provide enough to keep anyone busy for many visits. 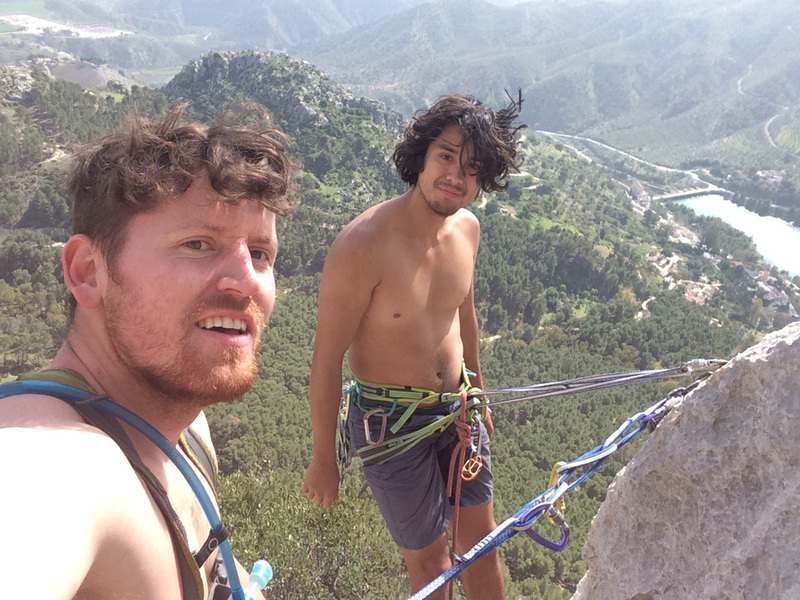 The best of the climbing tends to be on the huge ridge towering over the village which has a great mix of routes across the grades on crags like Frontales Bajas, Frontales Medias, Escalera Arabe and Las Encantadas. 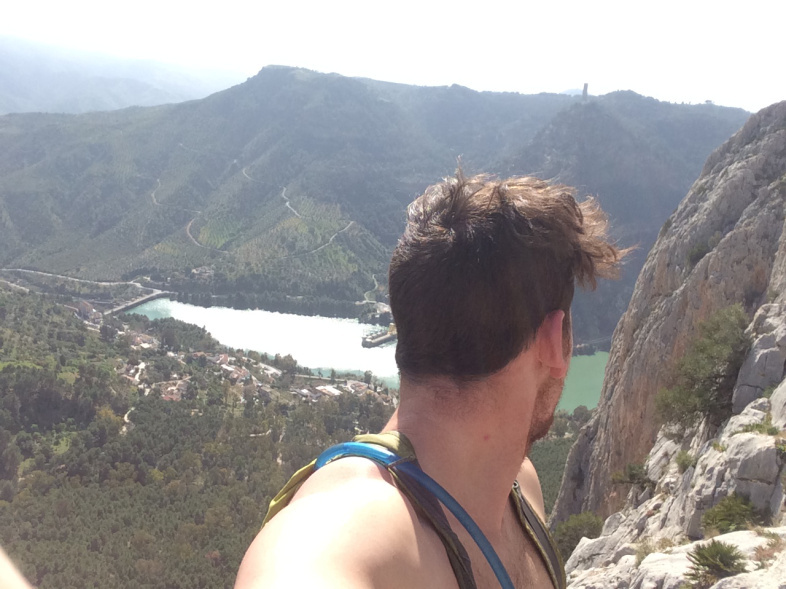 El Chorro – Lower Gorgeitself has many superb walls with a series of classics which are well worth picking off, especially if you want to sample the unique atmosphere of the approach along the crumblingCamino del Rey – the Walkway. Once through the Gorge the walls open out with another set of excellent crags in the vast central gorge area. Los Cotos is a litle on the polished side but great if the weather is cool; El Polvorin has superb classics across the grade, and hard climbers need look no further than El Makinodromo where you could easily spend your whole holiday attempting the world famous Lourdes (if you can cope with the walk-in). Though you definitely do not need a car, you may want to hire a car so that you can visit some of the other crags away from the village. This will bring some of the good/bad weather destinations into play like the magnificent shaded walls of Desplomilandia and Loja; the superb sunny slabs of Valle de Abdalajis and Túron; and the beautiful towers of El Torcal de Antequera. The Escalar en Malaga is the most complete, but is mostly in Spanish and has bad pics. The Escalada en Andalucia is one I never saw or used. ? There is a small shop in the tiny town of El Chorro. They sell a bit of everything. If you’re like me, you showed up with not enough chalk and without a guidebook. They can help you. October to May they say. It was damn hot in the month of March. I would think May may be too hot for some. Rain isn’t too much of an issue overall. It can get cold though, so having a down jacket and long climbing pants are key. Ohhhh and sunscreen. I saw some NASTY burns..especially on the English. Those boys are pastey. 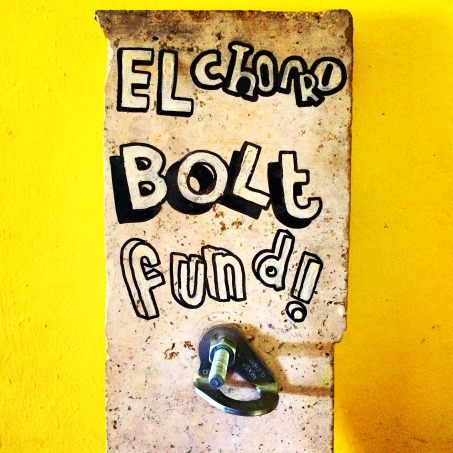 El Chorro Bolt fund. Read more below! Six weeks ago I had never heard of El Chorro. I had no plans to go climbing. I was sitting at home, in the cold Canadian winter with a vague plan to visit my sister in London for a couple of weeks. Drain your bank account, fill your heart up. Get way, way out there and do something.